Ametrine - polychromatic mineral, combining the signs of Amethyst and citrine, two-color variety of crystalline quartz, known as an Amethyst-citrine, two-color Amethyst, bolivianite or Ametrine. 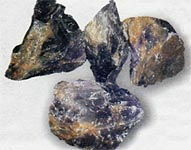 Wines-yellow, a gold citrine and violet-lilac Amethyst are varieties silexs which differ the presence of trace-elements. In nature at times there are polyzonal crystals, as combining in itself two minerals. 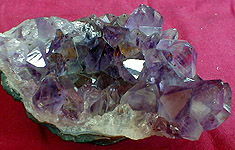 Such is gemstones color stones Ametrine, which has violet, lilac or rather yellow-peachy tint, they are not ideal often. Sometimes Ametrines can superficially paint over in a lilac color, to hide rather yellow and reddish areas, although such color is not marriage, but simply multicoloured (polychromatic) variety of quartz. Sometimes there are very beautiful joint, junction of different types of quartz crystals (the large crystals of one mineral become overgrown with more shallow crystals other). Today more frequent than all perfectly-transparent Ametrine is a synthetic crystal, from one side of which yellow, gold citrine, with other lilac Amethyst. Synthetic Amethyst usually very much transparent, clean, bright, without internal defects and multifocal uptake, can arrive at largenesses at the maintainance of cleanness. Ametrine usually cut so that maximally to show both colors, for what the border of flowers is disposed athwart to the ground of the cut stone. Ametrine is especially sensible to the sunbeams and ultraviolet as compared to all of other quartzs.